How to Store Your Ink Cartridges | TonerGreen - Eco-Friendly Toners from the U.S.
Inkjet printers, as we all know it, have a lower page yield compare to laser printers who are basically designed to be able to handle more than a thousand pages in one toner cartridge. This lead to inkjet printer users in buying stack or supplies of inkjet cartridges so they won't have to worry once their printer all of a sudden informed them that they're already low of ink in the middle of printing a very important document. Unfortunately though, some printer users claim that it is not wise to store ink cartridges since they often defunct and became obsolete if they happen to be stocked for too long. But the truth is, this is not always the case. This only happens when you don't properly store your ink cartridges. That's why to help you with this problem, here are some informative tips on how you can store your ink cartridges properly. Keep it in its package - It's very important to keep the ink cartridges on its package to avoid damaging it. Keeping it in its package also lessen the possibility of the ink drying up and clogging its printer nozzles. Take note of shelf life - This shouldn't suprise you at all because everything consumable has an expiration date and so does inkjet cartridges. And this is something you should keep in mind. Inkjet cartridges have an expected life of 24 months. This is divided between its shelf life which is consisted of 18 months and installed life of 6 months. 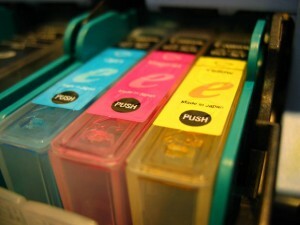 So make sure you use your stored inkjet cartridges before its 18 month or it might become obsolete. Inks can't handle heat - Heat is one of the main enemy of ink cartridges. It can make your ink cartridges useless in a second. This is because heat can cause air bubbles too expand inside the cartridge and cause the ink to leak. That's why its advisable to keep your inkjet cartridges in a dark and dry location between 40 to 80 degress Farenheit. Place it properly - Always place your inkjet cartridges properly and never place it upside down or on its side since this may cause the inks especially in multi-colored cartridges like HP inkjet cartridges to cross-contaminate or leak. Avoid touching the print head - At all cause, never touch or avoid touching the print head of your ink cartridges. The print head is the most sensitive part of your ink cartridges. Any light scratch you may make can damage the microscopic nozzles where the ink actually comes out from, thus leaving your ink cartridges defunct. Just follow these useful tips and you won't have a problem in storing your inkjet cartridges.